Talk about a season that’s going downhill fast. For the third straight week, the St. Louis Rams played embarrassing football in multiple ways, and as a result, dropping their third straight game, this time 16-13 to the AFC North’s Baltimore Ravens (2-7 entering the game). This game is also the second loss during their losing streak where they lost by a field goal: two weeks ago, they lost in overtime to the Minnesota Vikings 21-18, with Blair Walsh kicking the game-winning score for the Vikings. Suddenly, the Rams went from breathing right down the necks of the Arizona Cardinals for supremacy in the NFC West, to being all alone in third place in the division (Seattle won against San Francisco on Sunday). With the playoff race already the cluttered mess that it is, this was a game the Rams could not afford to lose. And now, the seats that head coach Jeff Fisher and general manager Les Snead sit on are heated more than ever. Fisher-led Rams teams have been 4-6 at the week 11 mark three out of his four seasons coaching the team. The other season? 3-6-1. None of the first three teams have made the playoffs and it’s unsure if this team were. Because with each passing day, at the rate they are playing, their chances are dwindling away. 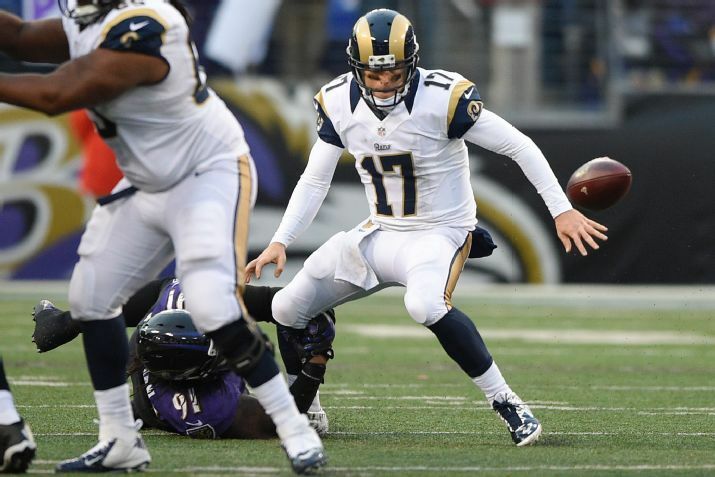 Against the Ravens, the Rams started Case Keenum at quarterback, following the benching of Nick Foles after the 37-13 loss to the Chicago Bears. Keenum’s first start did not remotely go as planned. He struggled to find a good mesh with any of his receivers (although throwing a good touchdown pass to Lance Kendricks during the game), and fumbled the ball three times, his most costly fumble coming with less than a minute left, leading to Justin Tucker‘s game winning 47-yard field goal as time expired. The final fumble occurred after Courtney Upshaw ran right past left tackle Greg Robinson to strip-sack Keenum. On offense, the Rams looked completely lost. Rookie running back Todd Gurley only had 66 rushing yards on 25 carries, with a 2.6 YPC. He did, however, score a touchdown in the game. Kendricks led the team in receiving, with two receptions for 43 yards and a touchdown. Keenum went 12/26, 136 yards, one touchdown and no interceptions, but once again, fumbled three times, losing two of them. And on top of all the problems the Rams have had this season, their offensive line struggled to protect their starter, notably Robinson, whose career has not even remotely lived up to expectations. He is statistically the NFL’s most penalized lineman. For the Ravens, who have been competitive in all of their games this season, with each game being decided by 10 points or less, two big losses put a damper on what should be a big victory for them. First, their leading rusher, Justin Forsett, broke his right arm when being tackled by Aaron Donald early on, and is out for the remainder of the year. Also out for the remainder of the year is quarterback Joe Flacco, who tore both his ACL and MCL during the final drive. He finished the game with 299 passing yards, a touchdown and two interceptions. Javorius Allen, the running back who took over the duties of Forsett, finished with 67 rushing yards on 22 carries. Sunday’s game wasn’t one-sided, however. Both the Rams and Ravens failed to move the ball well on offense. In fact, during the third quarter, there was a two-play span where two turnovers occurred. First, Keenum and Gurley failed to connect on a hand-off, leading to a Baltimore fumble recovery. The very next play, Flacco threw an interception to Trumaine Johnson in Ravens territory. That summed up how the game went. At the end of the fourth quarter, both teams had a chance to win the game off of a late field goal. First, Greg Zuerlein, who missed an extra point earlier in the game, missed a 52-yard field goal with 1:41 remaining for the Rams, and later, Tucker was wide right on a 51-yarder with 1:13 to go. With the 16-13 loss, the Rams are 4-6 and head to Cincinnati next week to face the first-place Bengals. The Ravens head to Cleveland to face the well-rested Browns on Monday Night Football.